The clinic, where I work part time, holds an annual open house each December. Last year I was manning my “Holistic Veterinary Care” station, chatting with clients and sipping hot cocoa, when my imagination was captured by the simplest idea. Naturally, at a veterinary hospital open house, pets are welcome. I had treated Morgan, one of our technician’s dogs, a few times and was happy to see her headed my way across the parking lot sporting a festive bandana. Accompanying her was the technician’s husband Todd, who is the closest thing I’ll ever meet to Leonardo DaVinci. "Look what I did for Morgan,” were his first words. He pointed at her furry Aussie paws and smiled. I took one look at her toenails and goosebumps covered my arms. Todd had concocted rubber rings for Morgan’s nails which I inherently understood would give her traction. I was awestruck because a dog’s natural mechanism for traction is to flex the paws and engage the nails. Yet never before had anyone considered traction from the standpoint of the dog’s toenails. 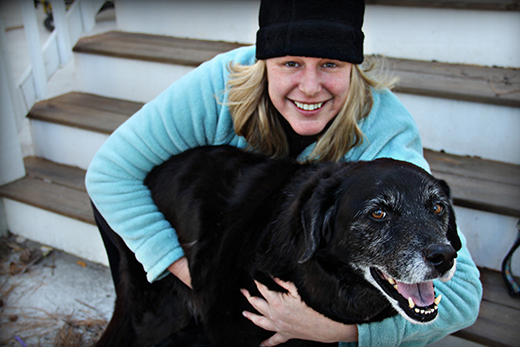 At 16-years old, Morgan had been struggling with instability and arthritis. And she lived in a home with exclusively hardwood floors. 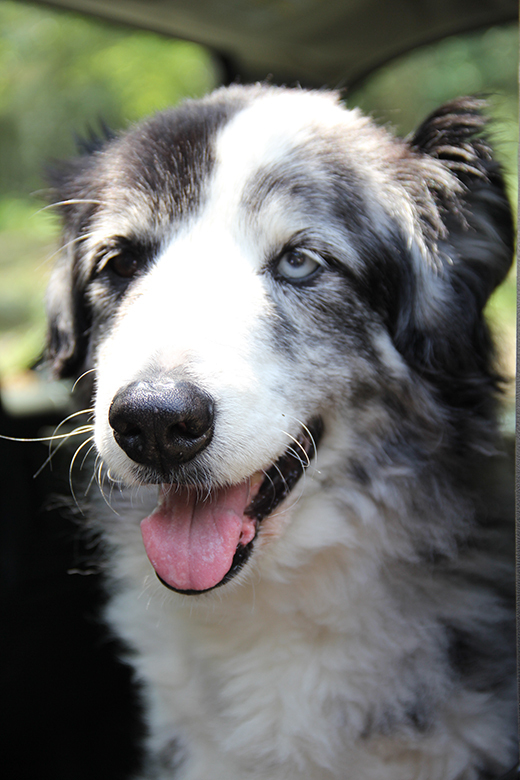 Morgan typified so many of my senior patients. As Todd shared what the grips had done for Morgan’s activity level and confidence, my mind raced with patients who could benefit from these little devices. I called one client immediately and arranged for Hope, her 15-year old Shepherd mix, to try these “toe grips”. A few days later, Kim and Hope pulled up to my house. “She’s having a bad day,” Kim called from the curb as she lifted Hope from the car. The grey-muzzled dog hobbled down my driveway. Hope had a knee surgery years earlier that had not healed correctly. As a result, she never put much weight on her right hind leg, and when she pushed off of it in normal stride, the leg always twisted out grotesquely. Sweet Hope flopped down obligingly in my driveway, while we put on her grips. Then she stood up, and walked away 75% improved! My jaw hung. The only logical explanation was that when she bore weight on her bad leg and it didn’t twist out from under her because of the toe grips, she was willing to bear more weight on that leg. I’d seen Hope every 3 weeks for the prior two years. She was on every manner of Western and alternative medication/supplement and I treated her regularly with acupuncture and chiropractic. She was holding her own, but I could never affect the slipping and twisting of her leg. It was a biomechanical problem, and the only solution I could suggest was throw rugs. But in less than 5 minutes (the time it took to apply them), ToeGrips revolutionized Hope’s posture and gait. In my driveway that day, as Hope explored my shrubs with a smile, “Dr. Buzby’s ToeGrips” was born. 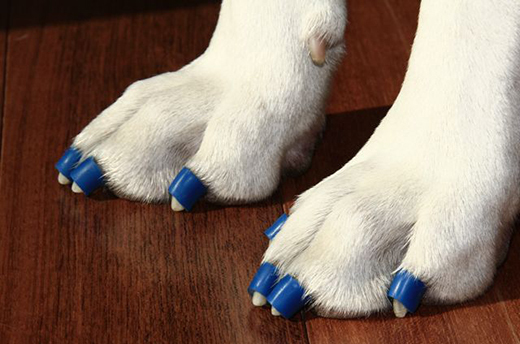 I knew we had to make ToeGrips available for senior dogs everywhere. We applied for a patent and began manufacturing small quantities of ToeGrips to beta test on dogs across North America. Most of my coworkers had senior dogs that they hoped ToeGrips would help. 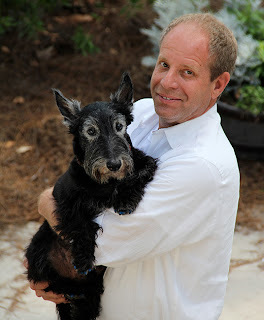 Gus, a 15-year old Scottie, was one of those dogs. The day Gus came for ToeGrips, he was carried up the stairs by Frank, one of our receptionists, who held his beloved companion while I applied the rings to his toes. I had never treated Gus before and had never watched him gait. So I didn’t understand why Frank became emotional when he set Gus down and the dog sauntered away across my hardwood floors. He was walking, even occasionally jogging. Frank explained to me that Gus had not walked that normally for years. Now, when Gus comes to visit, he runs up the flight of 13 steps to my front door! In all three of these dogs—Morgan, Hope, and Gus—the owners reported the initial, instant improvement, but also a cumulative improvement over time. At first, I thought this might be because the dogs were using themselves more correctly and building muscle. But then I received an email from a vet in New England who’d tried them on a patient and reported, “Interestingly enough, ToeGrips help this dog on any surface. We think this is because they are providing proprioceptive stimulus. And a lightbulb went on for me. Proprioceptive stimulus is perhaps the most critical mechanism by which ToeGrips help dogs. Since our website went live August 22nd, we’ve shipped ToeGrips to 42 states and 5 countries. I recommend ToeGrips as an integral part of the multimodal approach to senior pain/mobility management.